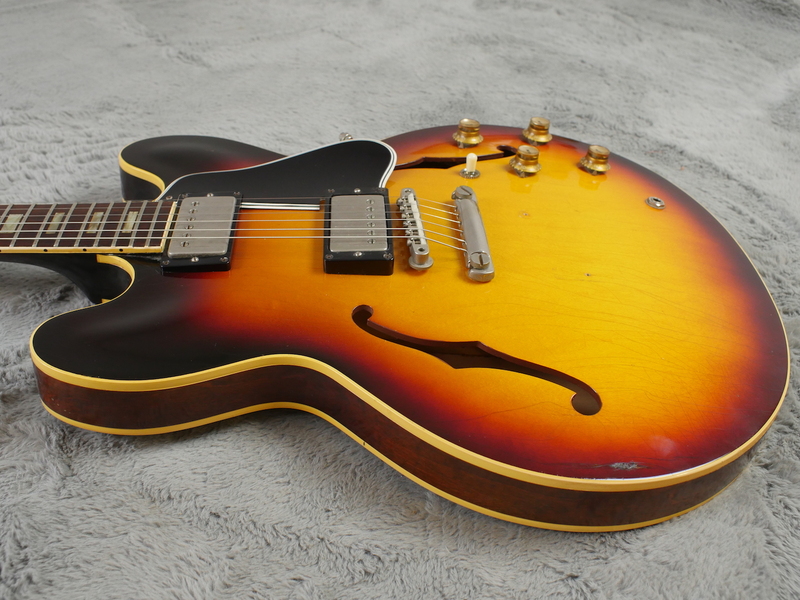 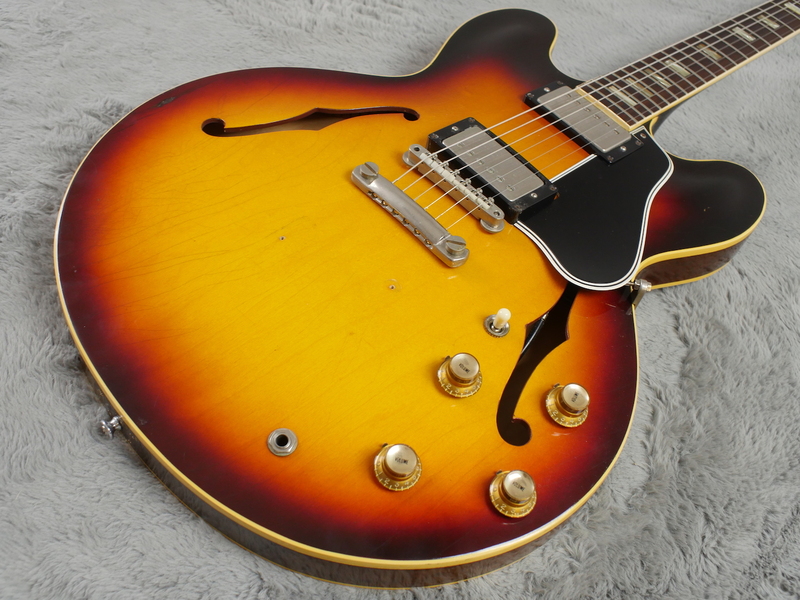 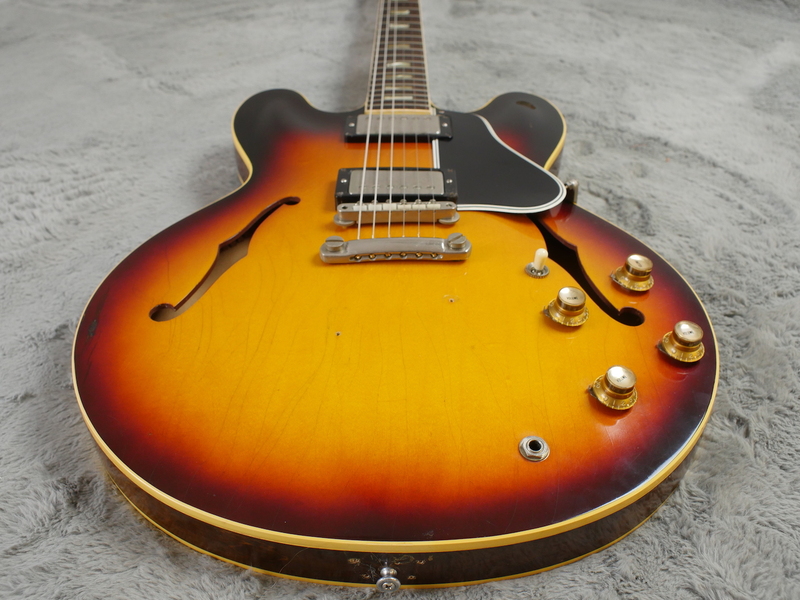 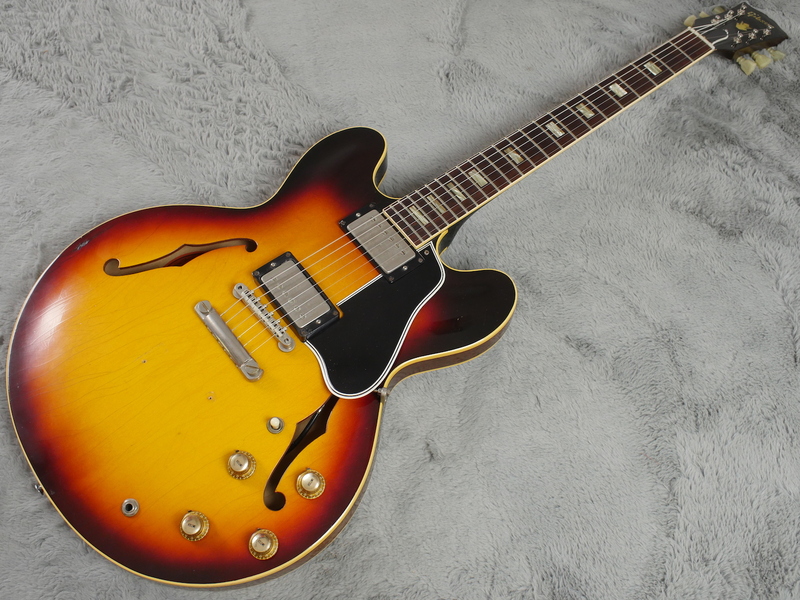 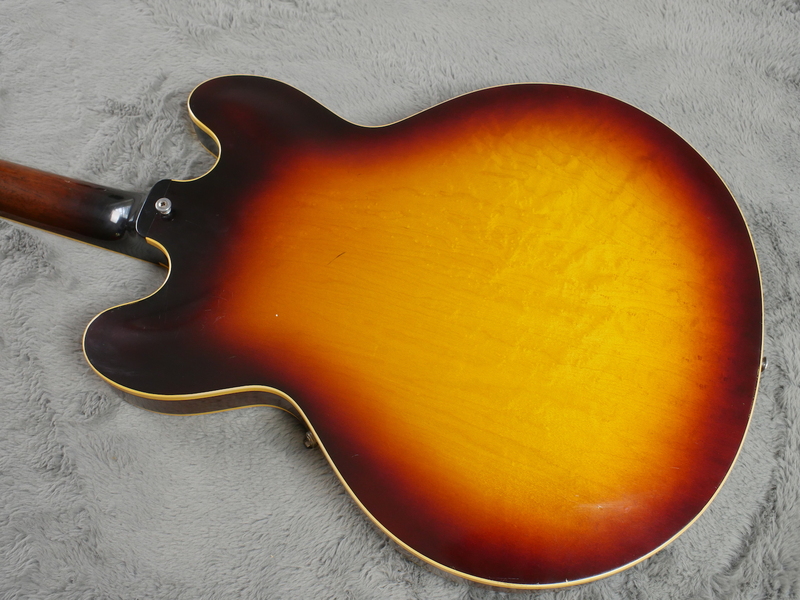 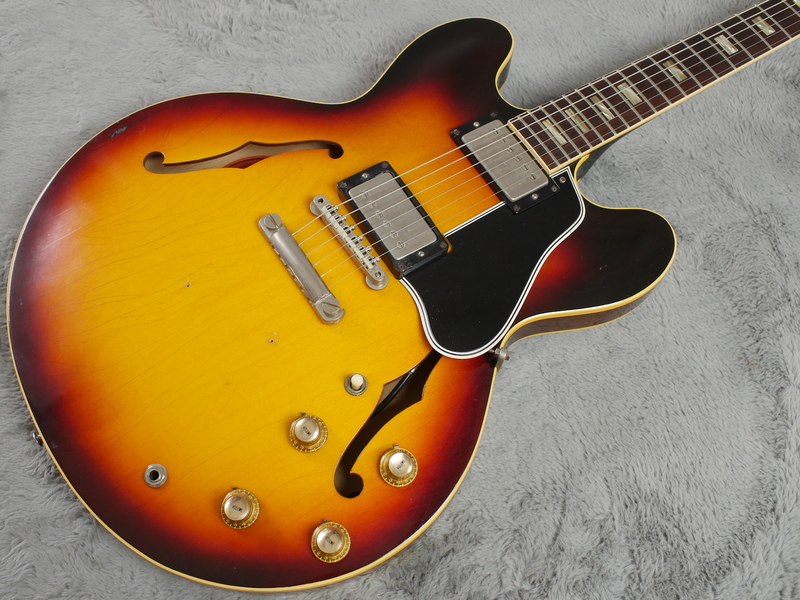 A real nice and nicely priced, vintage ES-335, one of the first block necks on the block, this one and being a changeover year, it has one PAF and one PAT number fitted, both unmolested and exactly the same pickup… guaranteed! 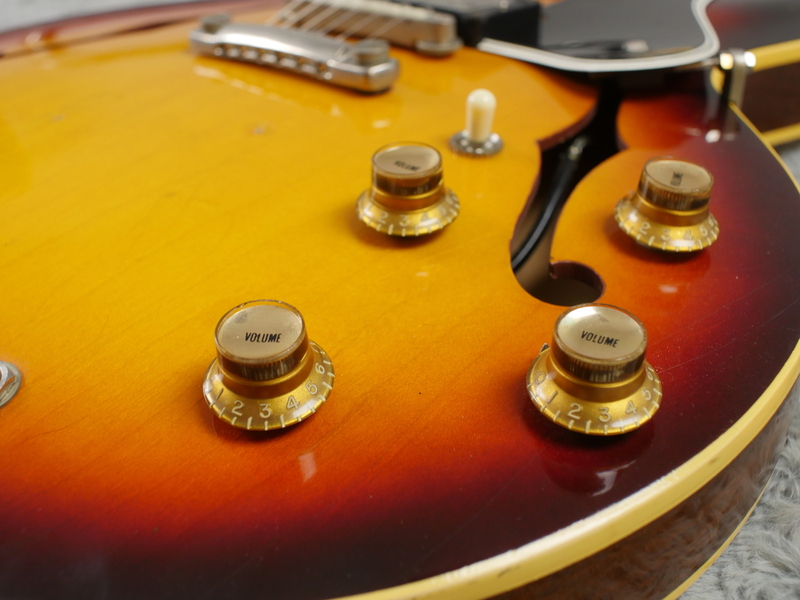 (less the sticker of course). 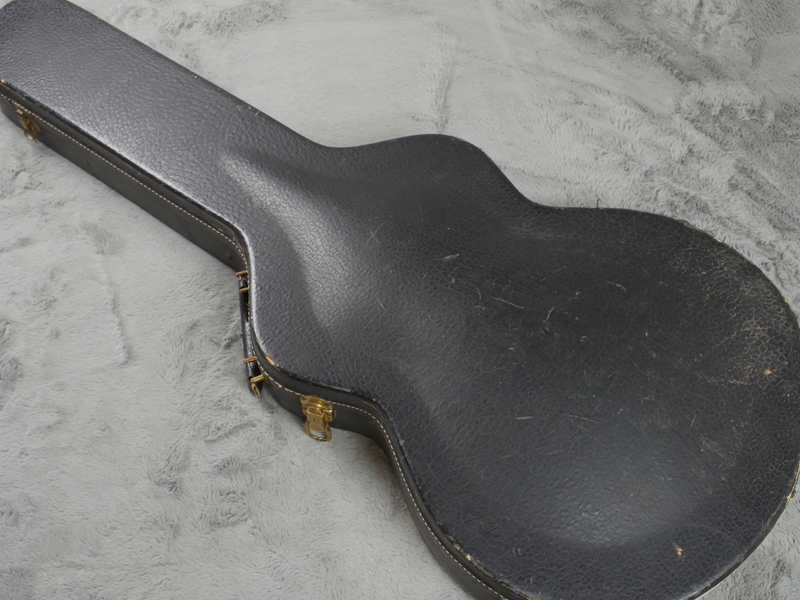 This came to us by way of an estate sale and so we were told, from the original owners family. 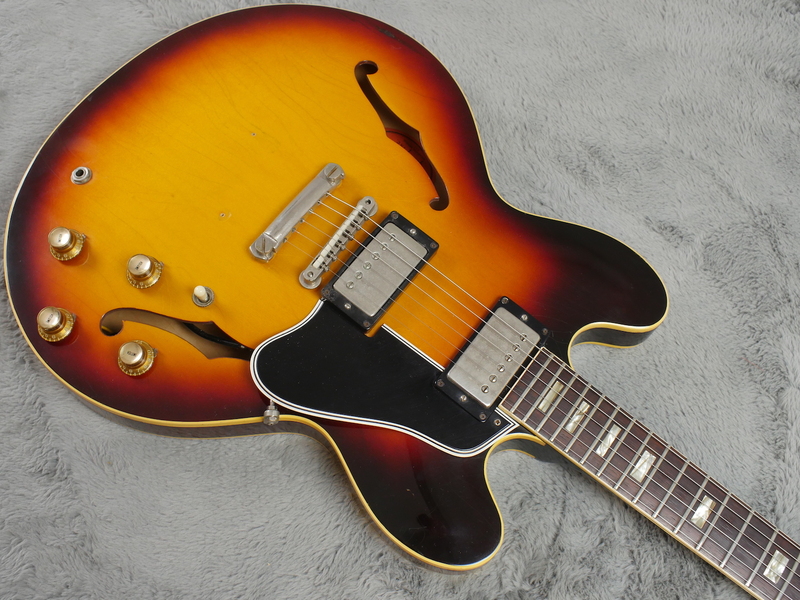 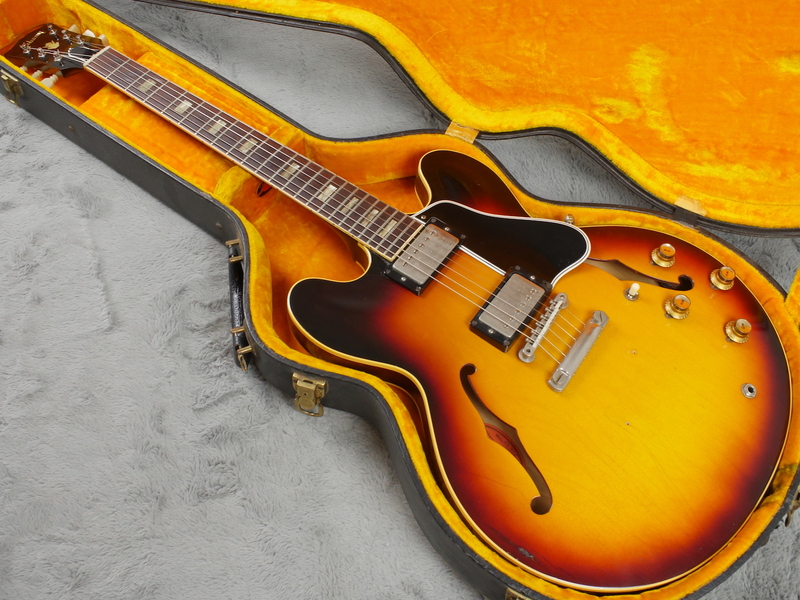 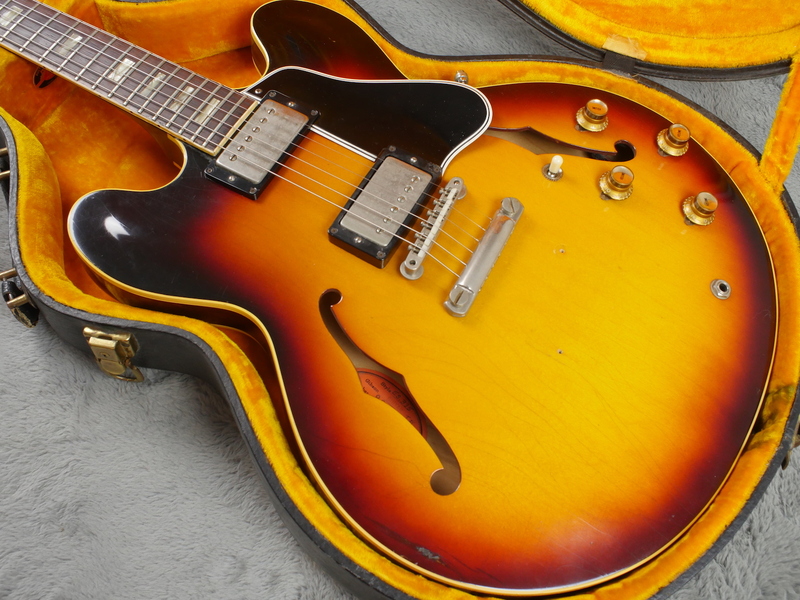 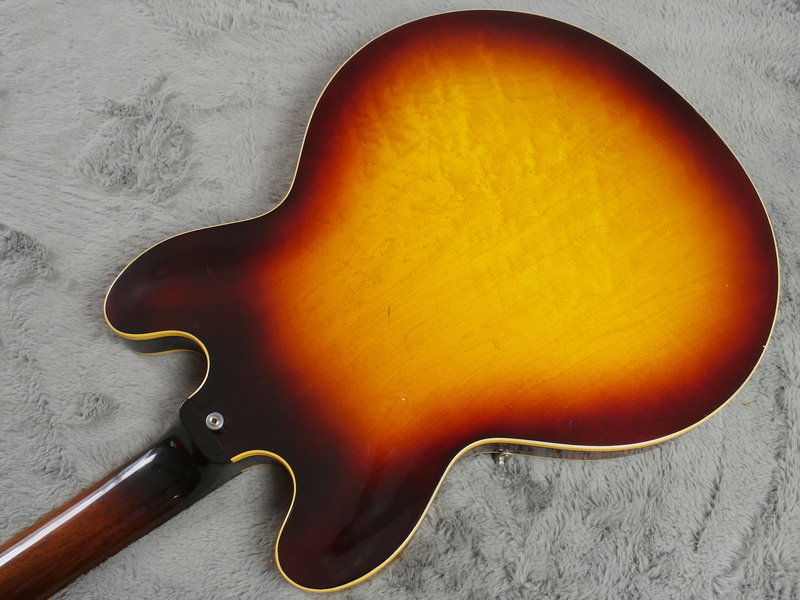 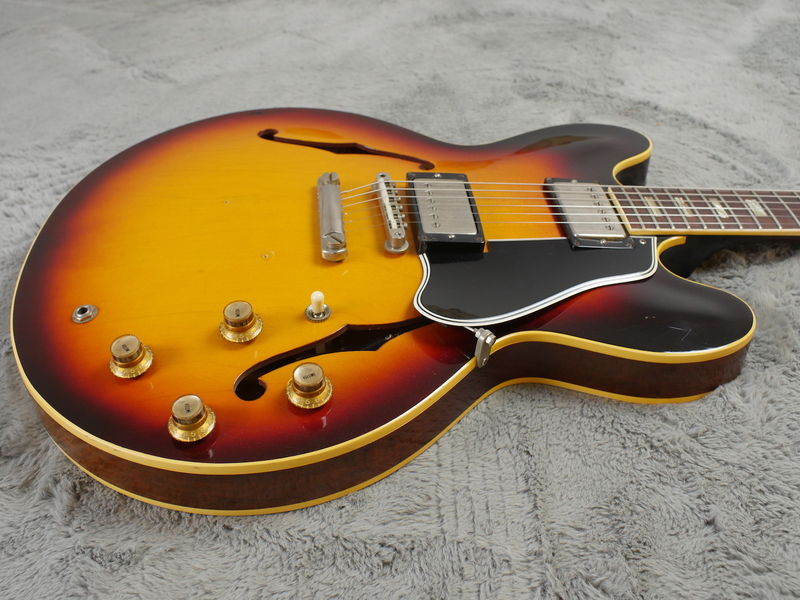 It is a 1962 Gibson ES-335 TD that we think, due to signs of an old ground wire at the tailpiece, to be a factory Bigsby with factory fitted stop tail anchors. 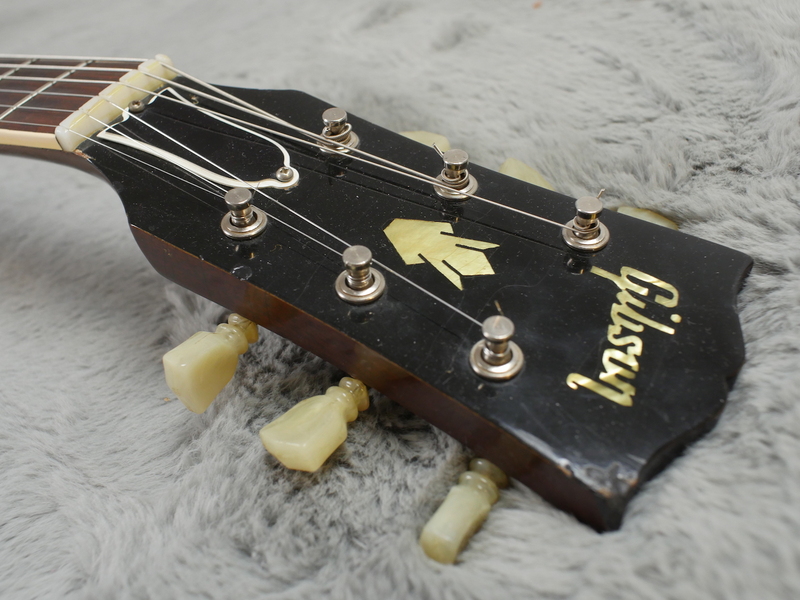 There are no nail holes for the usual ‘Custom Made’ plaque so if it had one, it was probably glued on, or possibly more likely it had pearl dots or similar covering up the factory fitted stop tail anchors. 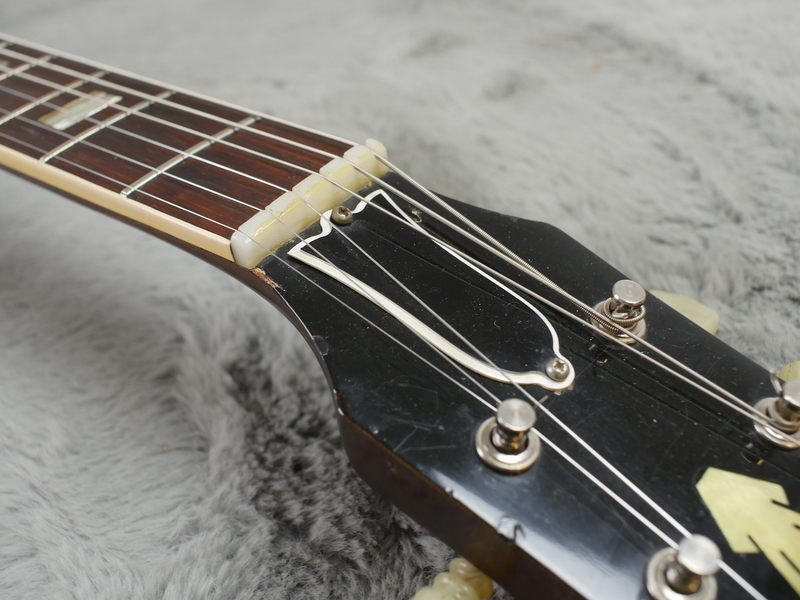 Whatever the reason, over time the Bigsby was removed (and lost) probably sometime in the late 60’s or early 70’s when a repro, chrome stop tail was fitted. 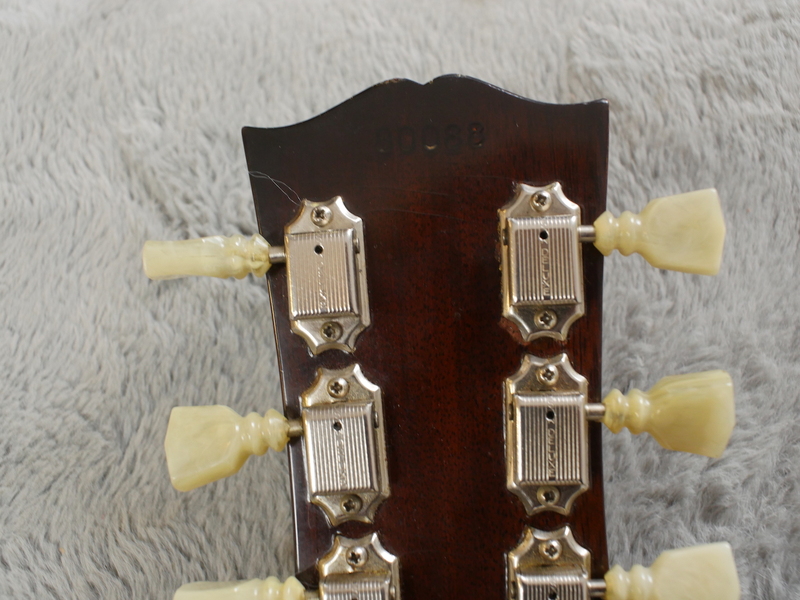 We have now replaced that with an excellent quality, aged genuine Historic nickel part that unless you flip it over, you would never know it was not the real thing. 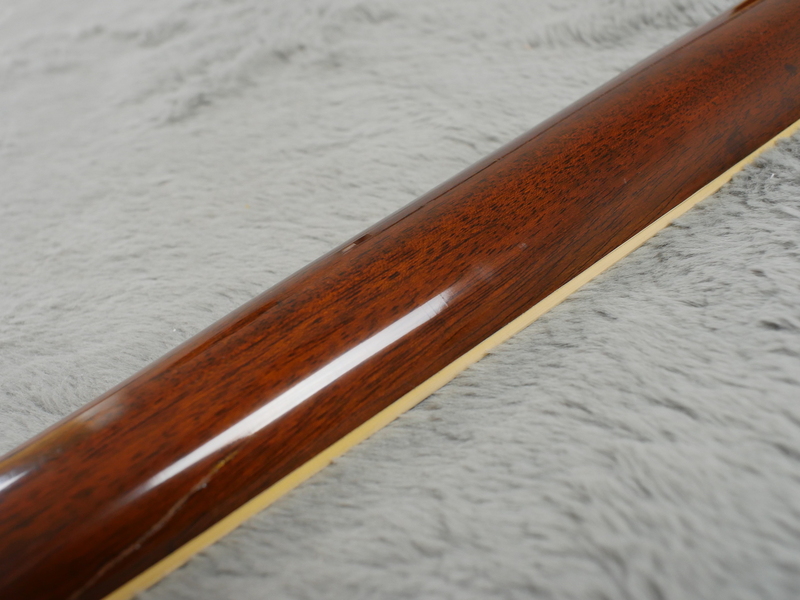 Condition of the guitar is actually quite excellent and aside from a repaired ding in the top at the top edge, it is pretty much a gleaming example and appears like it was little played. 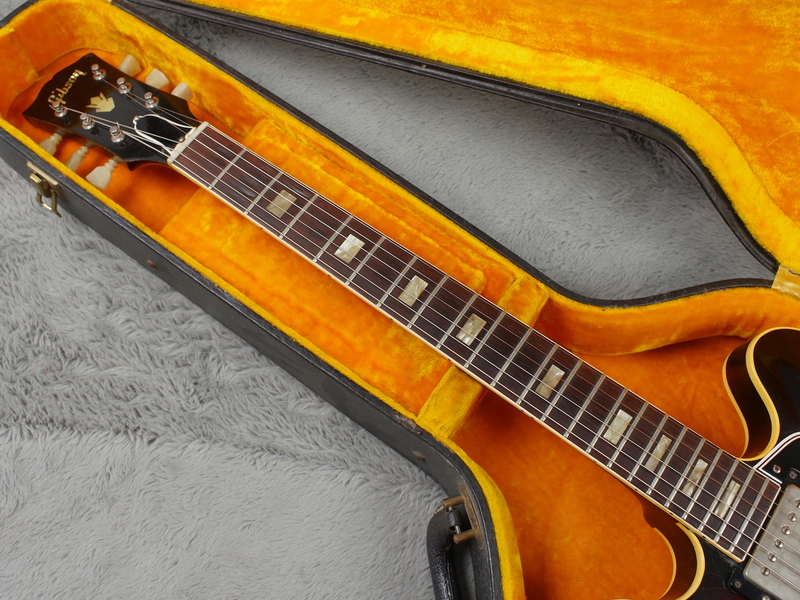 Sunburst is still bright and fade free with just the merest hint there used to be a Bigsby fitted. 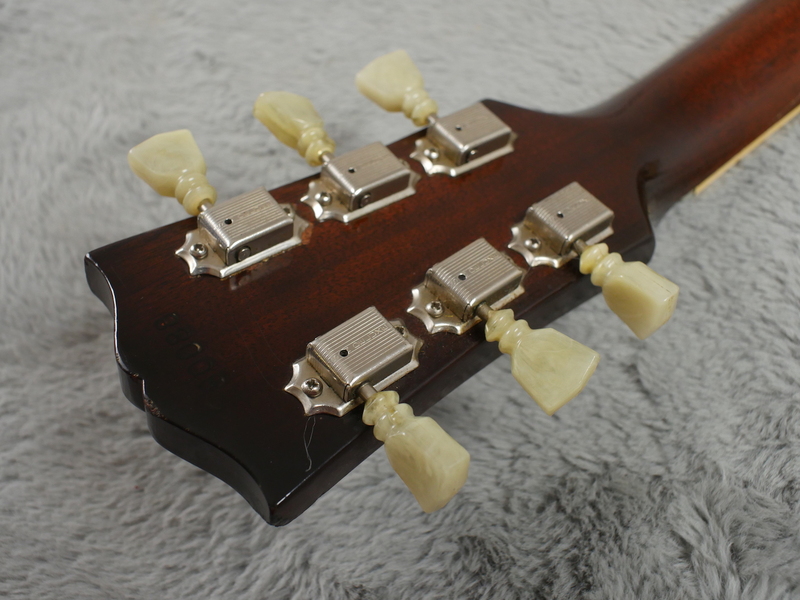 Back and back of the neck are both excellent and in very nice condition as indeed is the headstock which is very clean and not dog eared like you often see. 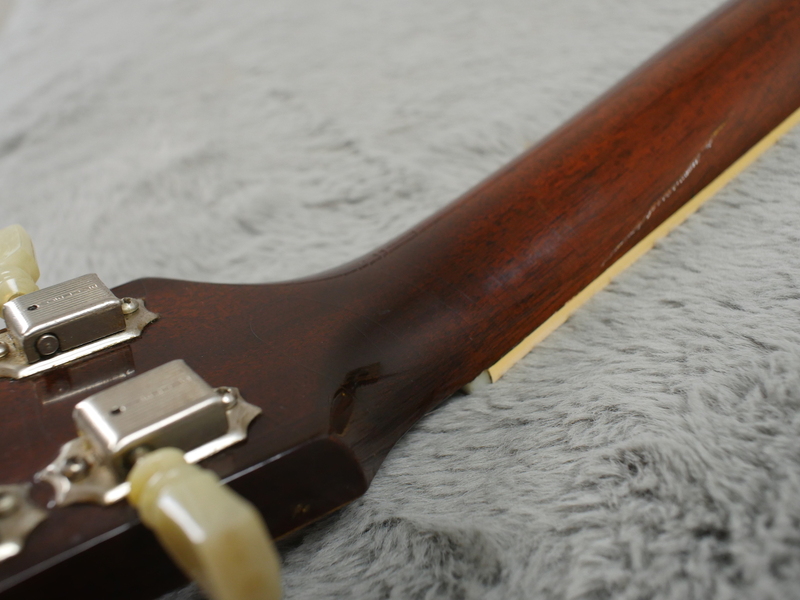 Front has a bit of checking just like you would expect. 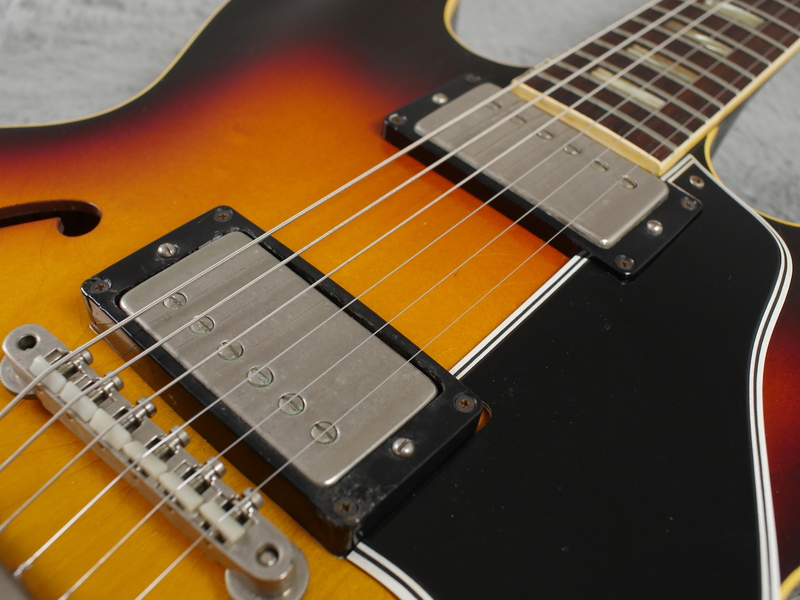 All virgin, unmolested electrics with all solder intact and brilliant sounding pickups that have never had the covers off. 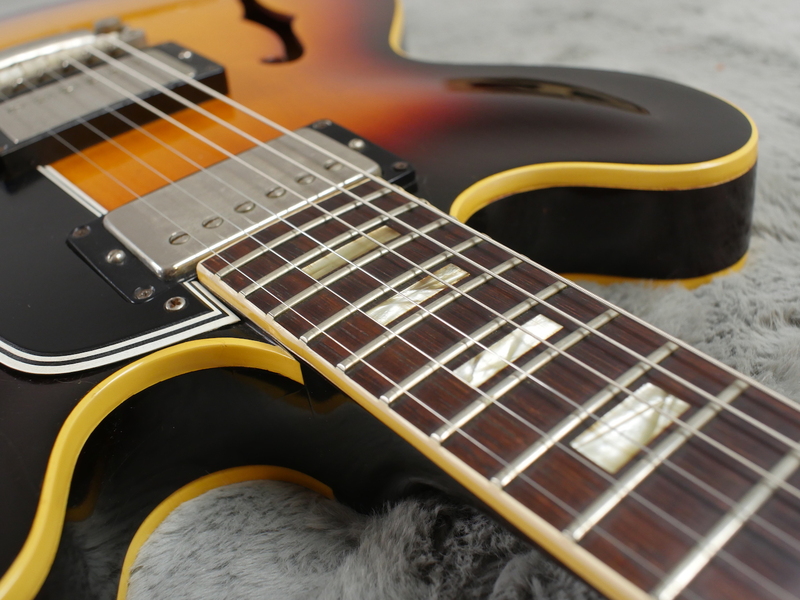 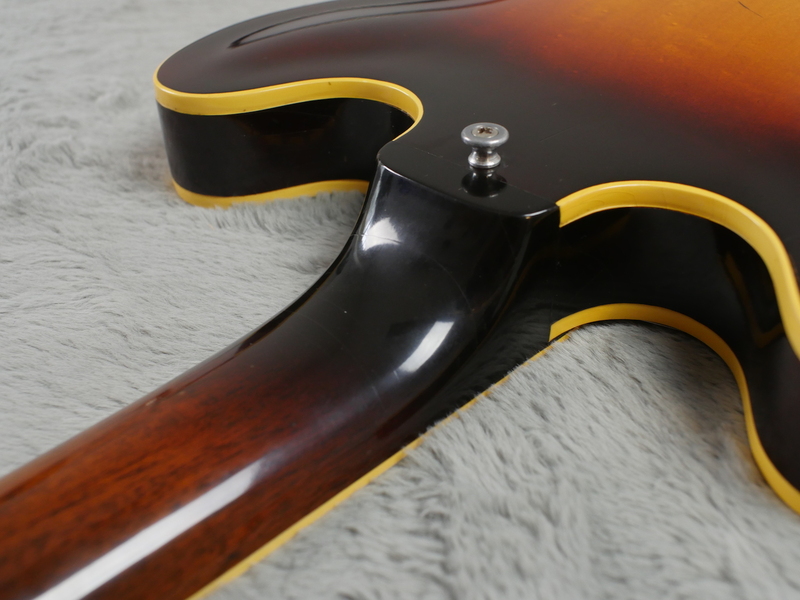 All other hardware (with the exception of the tailpiece) is totally correct including tuners, pickguard, plastic etc and case is the correct black with yellow interior. 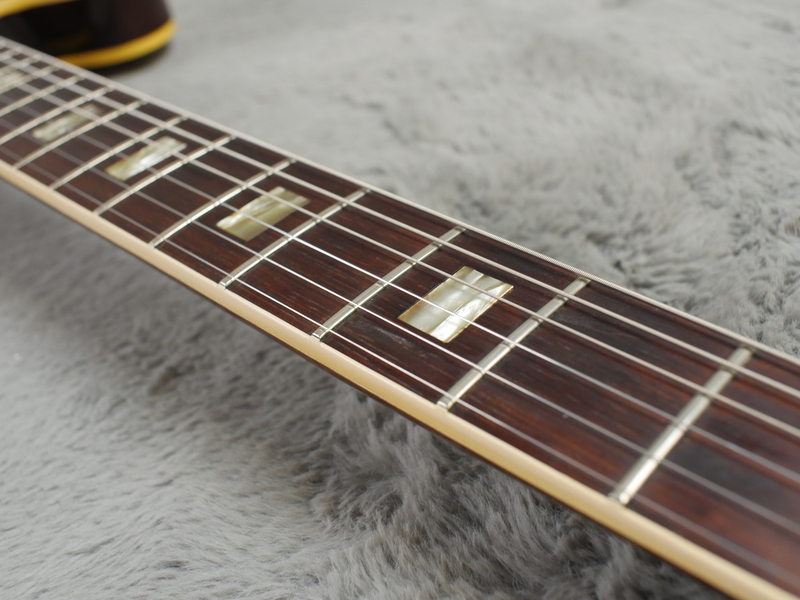 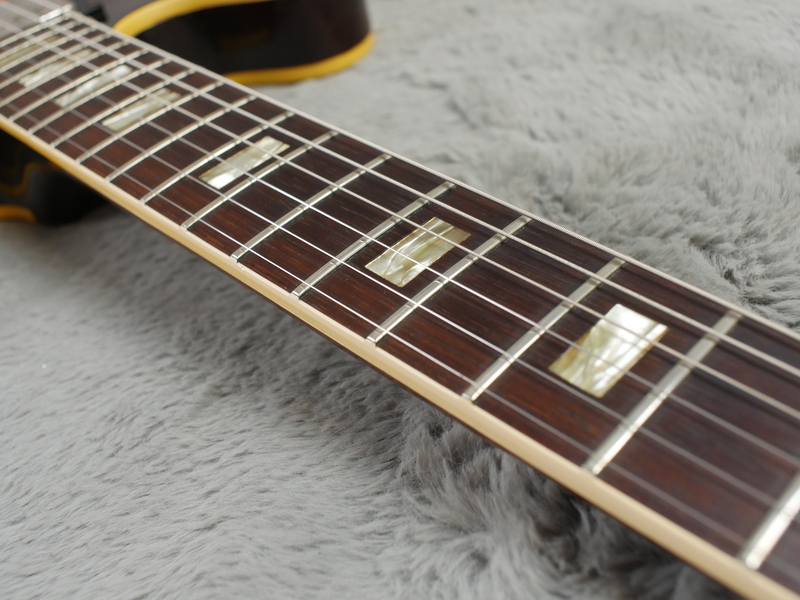 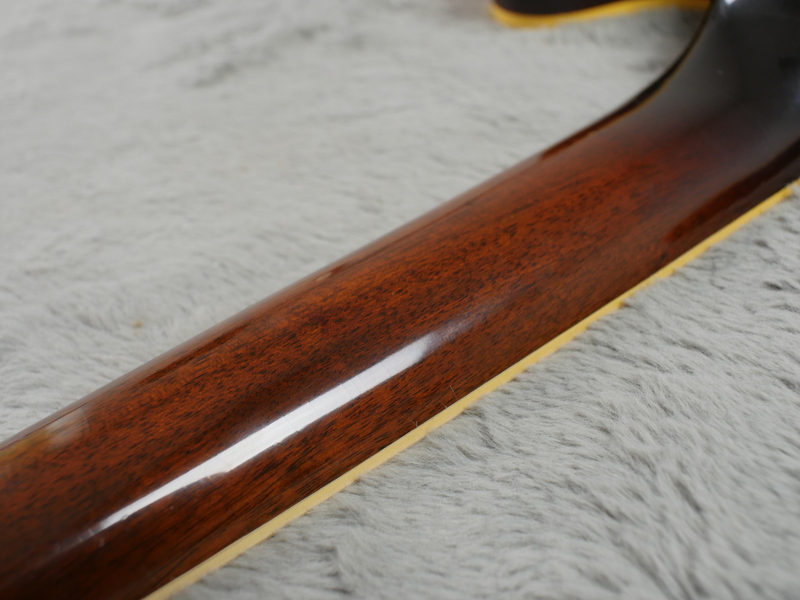 Neck profile is slimish and wide and frets are in superb shape, it will be a very long time before you need to think about a refret and guitar is well set up, with a superb playing action. 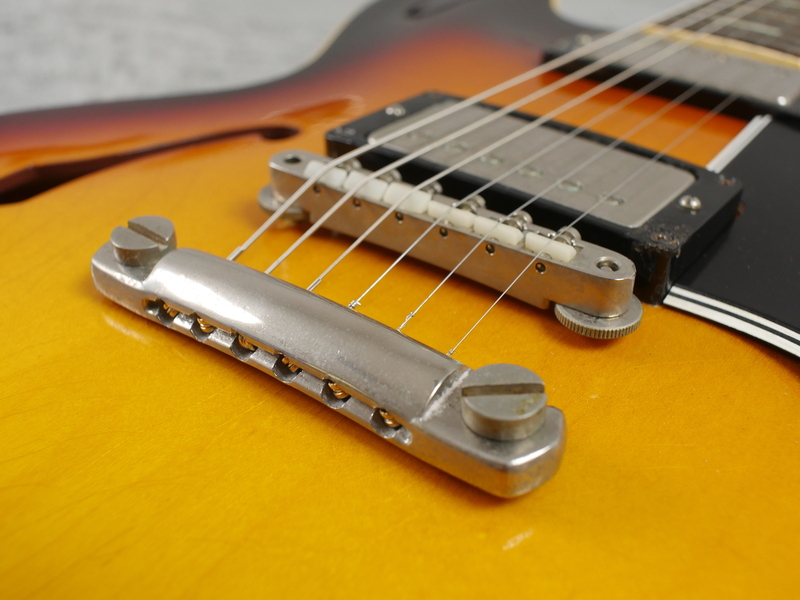 This guitar represents the best of both worlds - you can happily leave it as it is, or restore it back to probably how it was by finding an old Bigsby and some pearl dots… the choice is yours!